Indoor Skydiving Source presents the 2nd annual Indoor Skydiving Industry Report. 2016 proved to be the biggest year for the indoor skydiving industry yet. 35 locations opened around the world, blowing past the record 21 set last year. Please enjoy the infographic and recap below. Also be sure to take a trip down memory lane with our 2015 Industry Report. 32 publicly accessible indoor skydiving facilities opened in 2016 - see our open tunnel list. 3 private wind tunnels opened in 2016 - see the private /closed wind tunnel list. 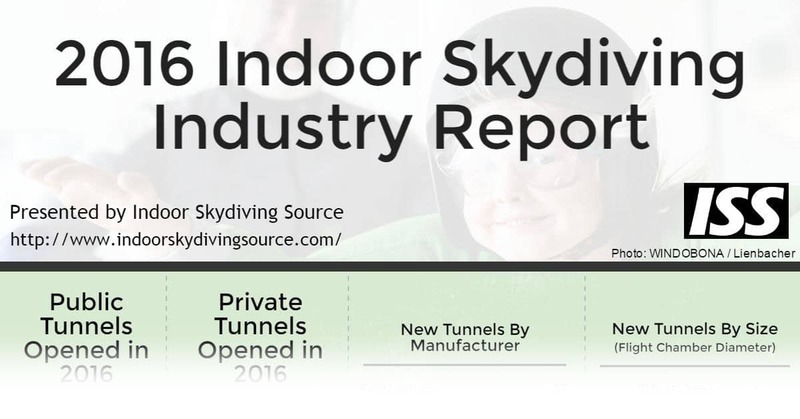 SkyVenture opened a whopping 22 new tunnels last year - more than the entire industry in 2015. 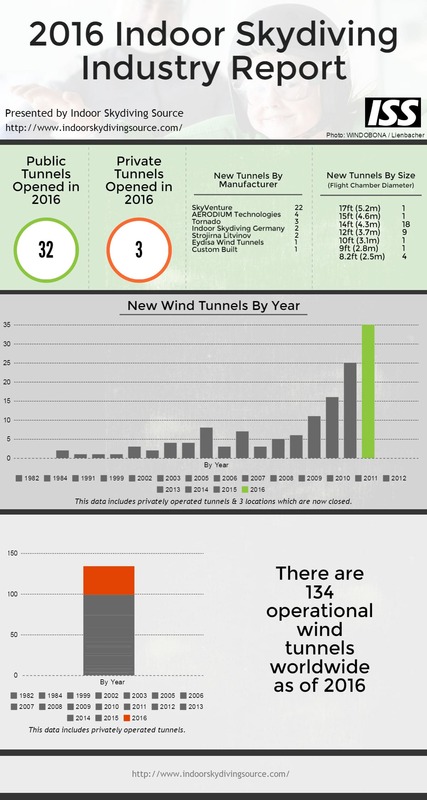 As of 2016 there are 134 operational wind tunnels around the world. Enjoy the report below and be sure to share! The self proclaimed "Crazy Ones" designed, built, and tested the first inclined wind tunnel used for indoor wingsuiting. The idea is brilliant, the video to prove it is mind blowing. Fly Vision GmbH of Germany is working with manufacturer Indoor Skydiving Germany to build what could become the next worlds largest wind tunnel. The facility will be a 17.4ft (5.3m) diameter tunnel. The site is located in Frankfurt, Germany with a projected opening in late 2017. Developer Miral out of Abu Dhabi announced plans for a 32 foot tunnel on Yas Island. The facility will also feature the worlds tallest indoor rock wall. The 2nd FAI World Cup was held at Flyspot this past October. The competitors from around the world competed in freestyle, dynamic, FS and VFS. World champions proved themselves among fierce competition. The 2017 Indoor Skydiving World Championship is planned for October in Montreal, Canada. AERODIUM Technologies built an open flight chamber recirculating wind tunnel for Disneyland in Shanghai. The tunnel is part of a Pirates of the Caribbean show in the park. In April, SkyVenture announced their plans to shut down their first facility and replace it with a new dual-tunnel facility. In an announcement from iFLY, the conclusion a legal battle between SkyVenture and Indoor Skydiving Germany was announced. The Fliteshop project that was planned for Scottsdale, AZ was terminated. In last year's recap there were 33 projects under construction and another 20 announced with opening dates in 2016. That ended with the 35 we saw actually open their doors. At the time of writing, we see 27 projects under construction and another 27 announced with projected opening dates in 2017. There are also 3 under construction and 3 announced for 2018. These numbers indicate that we will likely see similar numbers to what we had in 2016. The explosive growth we've seen for the past 5 years looks to be leveling out. Most major cities in the US and Europe have at least one indoor skydiving facility. The Asian market is also beginning to grow with locations opening in Japan, China, and South Korea. These new tunnels around the world, new technologies, and ever improving base of dedicated flyers shows big promise for the future. Vertical wind tunnels and bodyflying continue to take exciting steps forward. We will be here covering the action along the way. We wish all flyers safe and rewarding experiences in these amazing machines! Data for this report was gathered exclusively from the ISS location database.